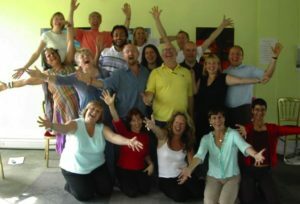 March 18th and April 15th: Laughter Yoga Leader Training : Three days in total: 10.30-4.15 each Sunday, with a follow on day for each participant where they run their own session with supervision and feedback. Training leading to a certificate from LYI. £250 per person (£200 early booking / concessions). Led by Robin Graham at The Monastery. May 20th: Exploring and playing with Gibberish: 11am-4pm (including a laughter club). Explore and play with gibberish conversations and therapeutic ideas. £30 (£20). Led by Robin at The Monastery. July 15th and August 19th: Laughter Yoga Leader Training : Three days in total: 10.30-4.15 each Sunday, with a follow on day for each participant where they run their own session with supervision and feedback. Training leading to a certificate from LYI. £250 per person (£200 early booking / concessions). Led by Robin at The Monastery. October 21st and November 18th: Laughter Yoga Leader Training: Three days in total: 10.30-4.15 each Sunday, with a follow on day for each participant where they run their own session with supervision and feedback. Training leading to a certificate from LYI. £250 per person (£200). Led by Robin and Paul. Laughter and the Body : 10.30-5.30. 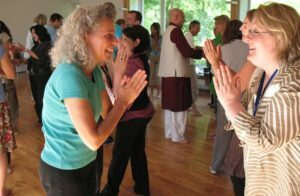 Laughter and body exercises to get a deeper understanding of what laughter is and where it comes from. £65 (£50 early bird and concessions) per person. Led by Robin Graham.